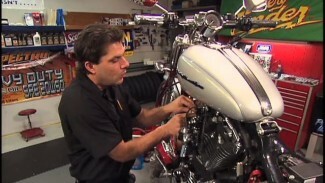 It is a good idea to lubricate your Harley clutch lever and front brake lever during routine maintenance. Many Harley Davidson’s now operate without the use of throttle or clutch cables but if your HD still has cables, it is good practice to lubricate these as well. If you experience a squeaking sound that is still heard after lubing the lever pin, try lubing the master cylinder seal where the pushrod protrudes. You can use a product that is an aerosol spray with a straw, or use a lube that is applied with a syringe as Mike demonstrates. Just push up on the pivot pin. Set it down in there and give it a squeeze. Let the lube drip down and gravity will feed it in. Actuate the lever back and forth to help work it in. If the motorcycle is washed frequently, it will need more frequent lubrication. Verify that your circlip is on the bottom of the pivot pin. There are a number of products that work well. Use what works best for you. Only use enough lube for a light, even coating and make sure that any excess lube is cleaned up. Too much lube left hanging around can actually be counterproductive as it will attract and hold onto dust and other road debris. Over time, it may become important to remove the Harley clutch lever and brake lever to thoroughly clean the levers, pins, and the general area. 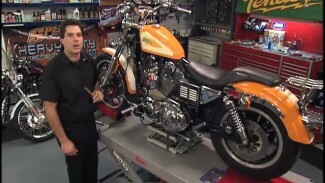 If your Harley clutch lever leads to a clutch cable, slacken the cable at the adjuster. 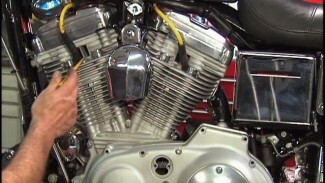 Remove the pivot pin so that the clutch lever and cable end can be removed, then remove the Harley clutch lever. Hold the end of the cable straight upward and work some lube into the cable, once again, allowing gravity to pull the lube down into the cable.